During runtime SlideButtons on the lower right corner of the screen may not respond to touch input. When running an experiment that utilizes buttons on a Surface tablet using Windows 10, the buttons may not respond to touch input. This behavior has been observed whenever the "Fix apps that are blurry" notification appears. This notification is Windows attempt to fix an application that it thinks is displaying incorrectly. If this notification appears after a test session where buttons do not work, select the option to not fix the applications and to not prompt. 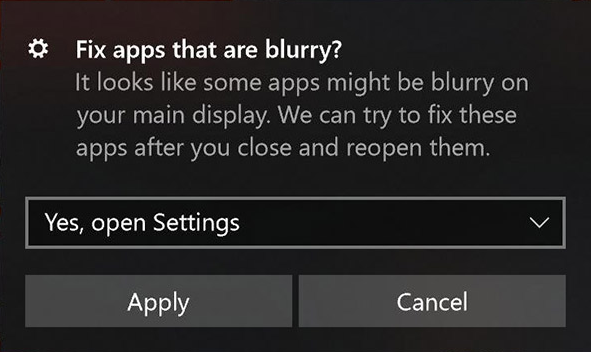 Turn off the "Let Windows try to fix apps so they're not blurry" option. NOTE: While Psychology Software Tools has only witnessed this behavior on a Surface tablet, it is possible that it could occur on other tablets as well.